As part of the evolution of the Nexus brand and product line, Google asked Autofuss to redesign the Nexus website. Historically Nexus had been a single line of mobile phones and the existing microsite suited this product lineup. 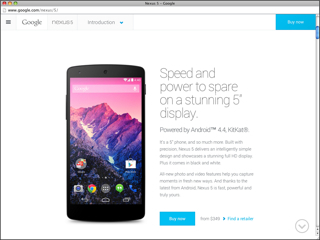 But as Nexus started to build a range of products including the Nexus 7 and Nexus 10 tablets while at the same time continuing to launch phones, their site needed to scale with the brand. At the same time, Nexus was moving from a brand targeted at developers using the Nexus phones as a reference development platform to a brand for mainstream consumers. With this in mind Autofuss, in a development partnership with Redshift and UNIT9, re-imagined the product site as a full fledged brand site for the Google Nexus family of phones and tablets.